The day is 3rd April 1968. The place, Room 306 at the Lorraine Motel, Memphis. 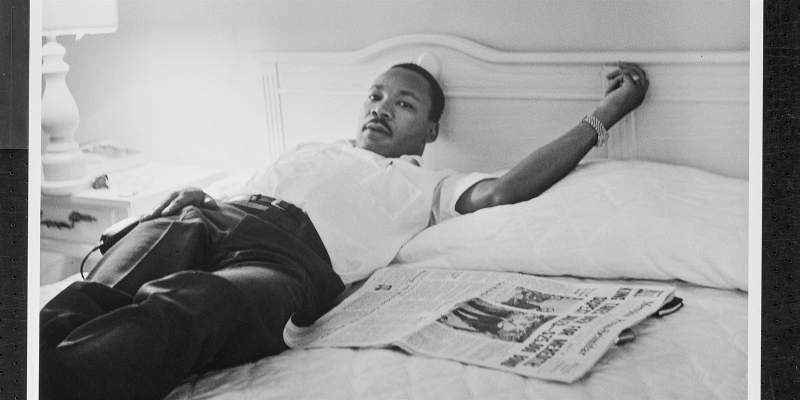 The man, Dr Martin Luther King Jr. A great man, one of the greatest – and yet just a man. The revival of Katori Hall’s Olivier Award-winning play about King’s final days comes to Northern Stage from Tuesday 9th-Saturday 13th October. The Mountaintop chips away at the myth of the great man to expose his fears about his family, his country and the ever-looming threat of a violent death. There’s a smell of cigarettes and coffee in the air as Dr Martin Luther King Jr winds down from a day of preaching and marching. Set during the height of America’s Civil Rights Movement, Katori Hall’s sharp and powerful play takes an intimate look into the quieter moments of King’s life. Set the night before the assassination, The Mountaintop does not shy away from challenging the legend that is Martin Luther King Jnr. At the same time, Hall confronts his legacy. Are we really as free as we think we are or do we live in a world of false liberation? Join Martin Luther King Jnr in that hotel room on that evening to reflect on courage, fear and everything in between.